Plumb is one of those groups that amaze you every time they do something. This was evident on their self-titled debut and is again evident on their new sophmore project, candycoatedwaterdrops. I was shocked when I first listened to candycoated.... The first song, "Late Great Planet Earth," a song about the end of the world, follows suit with their last album-- the guitar-driven modern rock with Tiffany Arbuckle's smooth vocals. But the rest of the CD threw me for a loop. 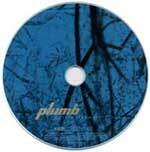 Don't get me wrong, the CD rocks, but forget what you know about Plumb. This is a whole new sound. "Stranded," a song about 2 Christians in love, has a more power-pop modern rock sound to it, which continues through most of the rest of the disc. The lyrical topics tackled on the album follow in line with their previous project, making it a signature trait of theirs. "Damaged" is a relatively dark tune about such abuse as sexual, emotional, and verbal. "Lie Low" is about a relationship that didn't work out and how one may tend to act as a result of it (negatively/positively). "World's Collide: A Fairy Tale" is about a relationship that Tiffany experienced that seemed too much like a fairy tale on the outside, but on the inside, the relationship was missing something spiritually. But one of the most controversial songs is the mellow, and beautifully orchestrated "Drugstore jesus" (notice the deliberate lower case "j"). In a promotional interview for Essential Records, Tiffany Arbuckle described the song, "When you enter a drugstore, on the shelves you usually find cheap imitations of the 'real thing,' whether it's perfume or a costume. 'Drugstore jesus' is about someone who only offers a cheap imitation of the real thing, Jesus Christ (with a capital "J"). Those who get caught up in fame and glory of the lime light end up selling their own souls for what they have been teaching against..."
Tiffany's newest musical influences (Jewel, Sarah McLachlan, and others) are evident on this project, as well. The title cut has a sound reminiscent of Sarah McLachlan's song "Angels," (City of Angels film soundtrack) with a more complete instrument-layered sound. Despite the shock that some Plumb fans may receive when they first listen to the new changes with this disc, Plumb has opened new doors with a new sound that should make some waves in Christian music. Plumb is proving themselves to being a band that can successfully put out one of the best modern rock/pop albums in music today.